Prize-winning author of 15 books and Emmy Award-winner Simon Schama brings to life Jewish history and experience in a new five-part documentary series. The five-hour series follows Schama - who has written and presented 50 documentaries on art, literature and history and is a contributing editor of the Financial Times, as he travels from Russia and the Ukraine to Egypt, Israel and Spain, exploring the imprint that Jewish culture has made on the world and the drama of suffering, resilience and rebirth that has gone with it. 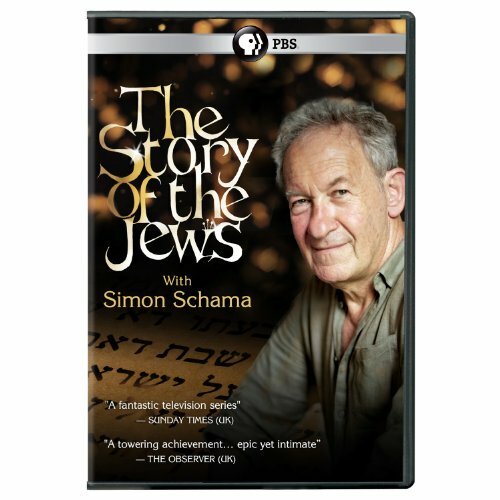 Arlington, Va. - April 24, 2014 - PBS Distribution today announced it is releasing The Story of the Jews with Simon Schama on DVD. Prize-winning author of 15 books and Emmy Award-winner Simon Schama brings to life Jewish history and experience in a new five-part documentary series. The five-hour series follows Schama - who has written and presented 50 documentaries on art, literature and history and is a contributing editor of the Financial Times, as he travels from Russia and the Ukraine to Egypt, Israel and Spain, exploring the imprint that Jewish culture has made on the world and the drama of suffering, resilience and rebirth that has gone with it. The series is, at the same time, a personal journey for Schama, who has been immersed in Jewish history since his postwar childhood; a meditation on its dramatic trajectory; and a macro-history of a people whose mark on the world has been out of all proportion to its modest numbers. The Story of the Jews with Simon Schama will be available on DVD May 6, 2014. The run time of the program is approximately 300 minutes on 2 discs. The DVD SRP is $29.99. The program will also be available for digital download. "If you were to remove from our collective history," said Schama, "the contribution Jews have made to human culture, our world would be almost unrecognizable. There would be no monotheism, no written Bible, and our sense of modernity would be completely different. So the history of the Jews is everyone's history too and what I hope people will take away from the series is that sense of connection: a weave of cultural strands over the millennia, some brilliant, some dark, but resolving into a fabric of thrilling, sometimes tragic, often exalted creativity." The Story of the Jews with Simon Schama draws on primary sources that include the Elephantine papyri, a collection of 5th-century BC manuscripts illuminating the life of a town of Jewish soldiers and their families in ancient Egypt; the astonishing trove of documents - the Cairo Geniza - recording the world of the medieval Jews of the Mediterranean and Near East; the records of disputations between Christians and Jews in Spain; correspondence between the leader of the Arab revolt during World War I, Emir Feisal, and the leader of the Zionist movement, Chaim Weizmann. Schama talks about the turning points of the drama with living witnesses like Aviva Rahamim, who, as a 14-year-old, walked across the Sudanese desert to try and reach Israel; Yakub Odeh, the Palestinian whose village was destroyed in the war of 1948; and Levana Shamir, whose family members were imprisoned in Egypt at the same time. He debates the meaning of new archaeological discoveries of the Biblical period with Yosef Garfinkel of the Hebrew University; the Dead Sea Scrolls with their chief curator Pnina Shor; the character of the Talmud with Leon Wieseltier, literary editor of the New Republic; the photographic record of Israel's history with Micha Bar Am; German cultural treasures from Enlightenment Germany and the music of Felix Mendelssohn with the critic Norman Lebrecht. synagogue mosaics, spectacularly illustrated Bibles, the brilliantly colorful decoration of synagogues (contrary to impressions of a monochrome religion), as well as the glorious music that carried Jewish traditions through the centuries. Whether he's amid the stones of 11th-century Judea, the exuberantly decorated cemeteries of Ukrainian hasidic rabbis, the parlors of Moses Mendelssohn's Berlin or the streets of immigrant New York, Schama brings together memory and actuality, past and present, sorrows and celebrations, vindications and challenges and makes felt the beating pulse of an epic of endurance that has been like no other - a story that belongs to everyone. The Story of the Jews with Simon Schama is an Oxford Film and Television Production for BBC and THIRTEEN in association with WNET. Writer and presenter: Simon Schama. Executive producer for BBC: Martin Davidson. Executive producer: Nicolas Kent. Series producer and director: Tim Kirby. Executive producer for THIRTEEN: Julie Anderson. Executive producer in charge for THIRTEEN: Stephen Segaller. The Story of the Jews with Simon Schama is made possible by lead funding from The Paul & Irma Milstein Family. Major funding is generously provided by The Polonsky Foundation. Additional major support is provided by The Pershing Square Foundation, the Joseph S. and Diane H. Steinberg Charitable Trust, James and Merryl Tisch, Mortimer B. Zuckerman, the David Berg Foundation, Daniel and Joanna S. Rose, and the Lemberg Foundation. Support is also provided by the Corporation for Public Broadcasting and PBS. As New York's flagship public media provider and the parent company of THIRTEEN and WLIW21 and operator of NJTV, WNET brings quality arts, education and public affairs programming to more than 5 million viewers each week. WNET produces and presents such acclaimed PBS series as Nature, Great Performances, American Masters, PBS NewsHour Weekend, Charlie Rose and a range of documentaries, children's programs, and local news and cultural offerings available on air and online. Pioneers in educational programming, WNET has created such groundbreaking series as Get the Math, Oh Noah! and Cyberchase and provides tools for educators that bring compelling content to life in the classroom and at home. WNET highlights the tri-state's unique culture and diverse communities through NYC-ARTS, Reel 13, NJTV News with Mike Schneider and MetroFocus, the multi-platform news magazine focusing on the New York region. WNET is also a leader in connecting with viewers on emerging platforms, including the THIRTEEN Explore iPad App where users can stream PBS content for free.